Saxophonist Paul Flaherty has been playing free-improvisational music for many years and was introduced to us in the past year through his collaborations with drummer Chris Corsano (see AI #18) and with Corsano and trumpet player Greg Kelley (see AI #21). Flaherty's latest effort is a 70 minute solo set of free-improv jazz played on alto & tenor saxophone. This is an album that has grown on me over multiple listens, the power of the music lying in Flaherty's passionate and expressive playing style. His sax can be beautifully melodious or sonically harsh. Music that grabs you by the throat.... and caresses you. I like the considered moments of silence. They're typically barely a second, but are noticeable. It's like Flaherty is allowing himself and the listener an instant to breathe, or maybe even a moment of reflection before he launches into the next phrase. I also like the technique used on "Little Death", which sounds like Flaherty talking through his saxophone. And there's "But We Will Keep The Secret", on which we hear vocal yelps at the beginning that preface one of the most frantic pieces on the album. 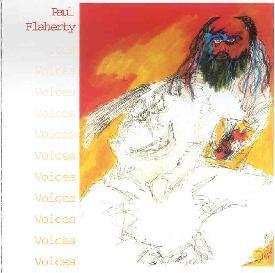 Improvisational music typically consists of very personal statements that come from the depths of the artists' soul, and in the liner notes of Voices Flaherty has chosen to share some inner thoughts that let us into the details of his musical world and make for a richer listening experience. It's interesting to learn that of 20 albums he has been involved in, Voices is his first solo release. However, this is far from being his first solo experience, having performed thousands of times alone, usually between 1:00-4:00am on the streets of his native Hartford, Connecticut. Listening with the headphones on I imagined myself walking under a bridge at night and spotting a lone man with a saxophone filling the night air with strange but seductive sounds. Recommended to fans of the free-improv avant-garde. If you're in the mood for one man's moving and passionate musical explorations, then surrender yourself to Voices. For more information you can write to Paul Flaherty c/o Wet Paint Music; PO Box 1024; Manchester, CT 06045.